This lesson is a Bansho inspired lesson (for more information on Bansho checkout the pdf in Materials section published by the Ministry of Ontario (2011). Purpose: Is to have students collaborate together sharing their ideas on polygons with partners, and to classify them in meaningful ways. 2. Remind students that there are many different answers to this problem, and we (as a class) are trying to come up with as many different solutions as we can. 3. Using title cards (or blackboard spaces) organize student's responses into categories. Begin with familiar categories (triangles, squares, and rectangles), but also make categories for irregular shapes that students discover, and get them to justify their category choices. 4. Make sure you fit in time for students to change/revise their ideas before they hand in (but after discussed with class). Categorization cards along the bottom atop of ledge. Extra chart paper with squares for students to demonstrate new ideas that came up during discussion. 1. When students have completed their first responses to the question, have them fill out their own math assessment check list (see photo left/download template from materials). Diagnostic: Can/Do students use math language in their answers (terms for polygons)? Summative: Students will submit work and photos for assessment. Some students may need more scaffolding through this approach to math (in my experience, students are typically looking at questions in a linear way, only one possible answer). Instead of giving direct answers, re-phrase the questions, or show answers and discuss HOW we got this. Be prepared to give students 'wait/thinking time' to process the questions. Try to avoid asking the first hands up, when you can get students to first discuss ideas with their partners. 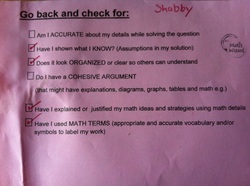 Always try to get class to assess responses (i.e., "What do we think about this? Where should it go? Why? Is there somewhere else?") (Rich Talk) Avoid stating that answers are wrong, or posing students responses in negative light. The purpose of this approach is to demonstrate to students that there are many ways to respond to these questions. However, some students may feel that one way of solving the problem is easier for them than others. Remind them that this is a learning process and everyone approaches it with different perspectives.